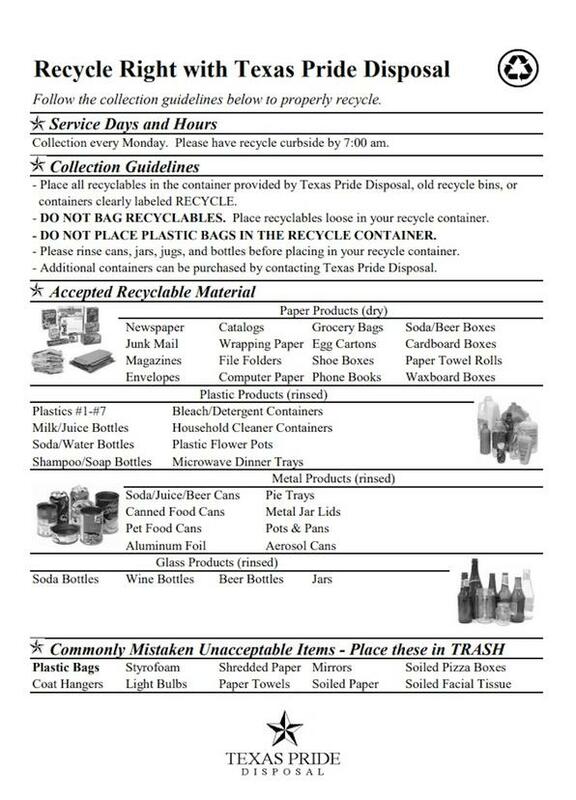 Trash pickup and recycling services for our subdivision are provided under contract by Texas Pride Disposal. again with a copy to Cindy. Residents may purchase additional 18-gallon recycle bins ($12), 32-gallon recycle cans ($30), or 65-gallon recycle carts ($75) directly from Texas Pride Disposal. Texas Pride Disposal will collect residential refuse and up to five (5) bags of yard waste located near the garage or side-yard gate. Heavy Trash, branches etc. (see above limitations) to be placed at the curb for collection on either of our two pick-up days..
Trash pick-up days are Mondays and Thursdays. Recycling colleced on Mondays only. Refrigerators and freezers must be drained of Freon and have a bill to validate that such service was performed. The item(s) can then be placed at the curb for pick up on either of the regular trash collection days. There is currently an economic crisis in the recycling industry The letters below explain the current situation and its causes. One major factor is contamination i.e. residents including in their recycling bins material that is not on the list of acceptable items for recycling and items that have food and drink residue. Please don't put anything into the recycling bins that is not clean. This includes pizza boxes as the grease is a major contaminant. And if you have any doubt as to whether an item is recyclable DON'T PUT IT IN THE RECYCLING BIN. Follow the guidance above - WHEN IN DOUBT - THROW IT OUT i.e. into the regular trash that goes to the landfill. Note that the Grocery Bags referred to are those made of paper NOT plastic. Absolutely no plastic bags of any kind are acceptable for recycling such as: plastic zip lock bags, plastic bags from retail stores, plastic bags from grocery stores, plastic garbage bags, etc…. Your cooperation in reducing contamination of the recycling load will hasten the end of the surcharge that we are paying. Thanks!